There are some users that love the light source in this Duronic SADV1 SAD Light Box and the ease of use. There are many positive comments about the impact that this SAD light therapy lamp has on mood issues, SAD and other winter-related problems. Some buy this for parents or children that struggle with the darker months. Many are pleased to see enough improvement. This could mean a little more energy in the morning or a less depressive state. Many attribute this to the light source. It might not be the most efficient LED bulb, but it is a pleasant tone with a steady output. It also has just the right LUX, especially when the lamp is used correctly. Many people can sit in front of this with ease and feel no ill-effect. As for the ease of use, there are two important factors to consider here. The first is the fact that this is a portable model, thanks to that thin tablet shape. Theoretically, users should be able to put it in a bag or briefcase and take it to work. 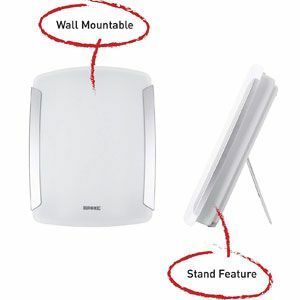 The design of the back of the lamp means that users also have the choice of either placing it on the desk and angling the light to their face, or hanging it on the wall. The second factor here is the ease of use in the controls and settings. There are so few buttons and settings that there is little to remember. Groogy SAD sufferers just turn it on and let it do its job. 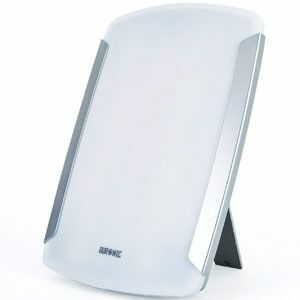 However, there are some users that are less impressed with this Duronic 10000 Lux SAD Light Therapy Lamp. The first issue here is the fact that different users seem to have different reactions to these sessions. There are some that are really pleased that they choose the product because of the potential for their mood issues. They see some improvement, but there isn’t a massive change. This will disappoint some people that expected a little more from this big, bright medically certified device. There are also those waiting to give their final verdict until later in the year. This suggests that some new buyers may need a little patience to get the very best out of this. On the subject of that big, bright light, there are some buyers that aren’t keen on the size. There is a sales photo for this lamp with the device sat by the side of a computer monitor. It looks comically large compared to other portable models on the market. Yet, this does seem to be an accurate representation. This is a bold statement in any office, and will catch the eye of other workers. Some find that it is too big to be comfortable to use. What does this all mean for the final verdict on this Duronic SADV1 Therapy Box? It sounds as though there are some contradictions with this lamp. It is big and bold, too much so for some users, but yet still has a portable nature. The lamp is vast, bright and medically certified for great effects on mood issues and SAD. Yet, there are some that don’t find it as effective, or at least as instantaneous as some other products. There is still great potential in this model for those that have the space and the patience to make it work. The Duronic SAD lamp is bright, easy to use and can help the right user. Find more reviews about the Duronic SADV1 SAD Light Therapy Box on Amazon here.